One of the things I would like to do this year is finish my children’s rooms. I have done small things here and there to all of them, but nothing that would be showcase worthy. 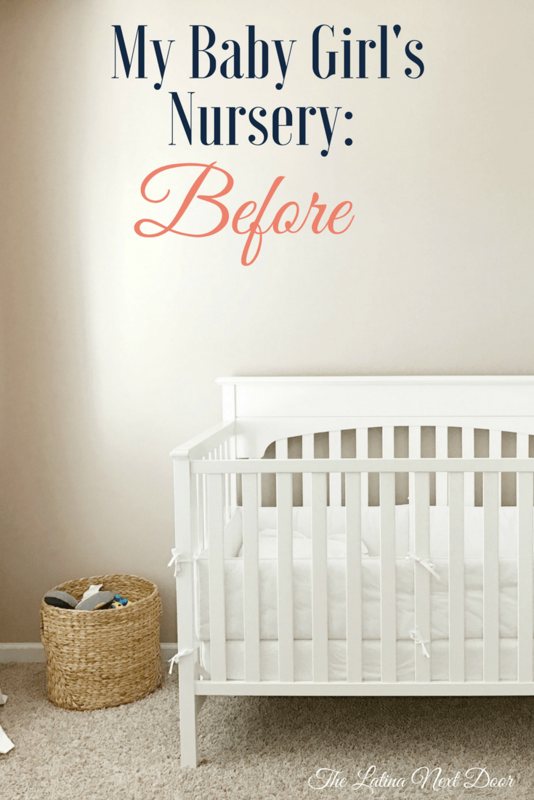 I feel as if we have neglected our littlest’s nursery the worst, as we haven’t done much to it at all. She’s our third – need I say more? Basically all we have done to the room is paint and add furniture. I feel terrible about it. It seems like time is passing way too fast and I need to hurry before she grows up! 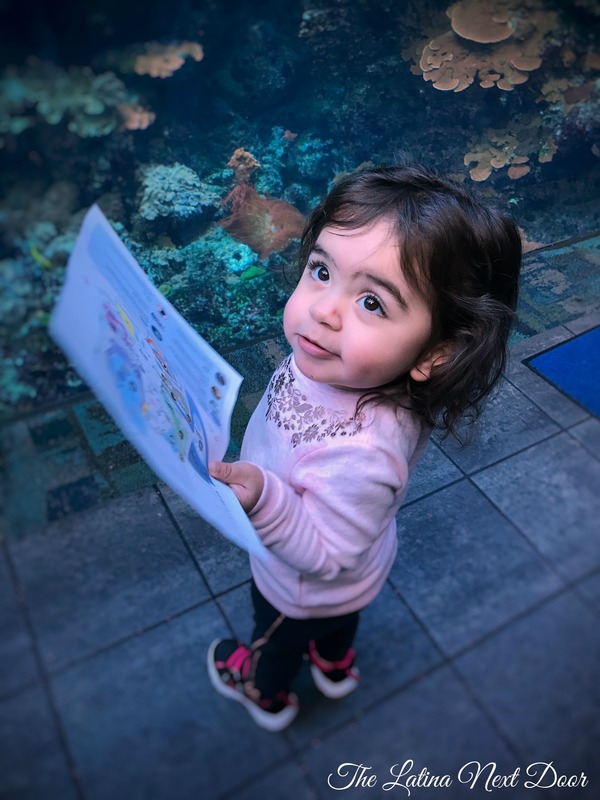 She really is the most spunkiest, free-spirited, fearless, happy little girl. She’s also has the sweetest smile and is best cuddler- she loves hugs more than anyone I know! So I thought I would do a little something special to add some of that sweetness and fun into her room. 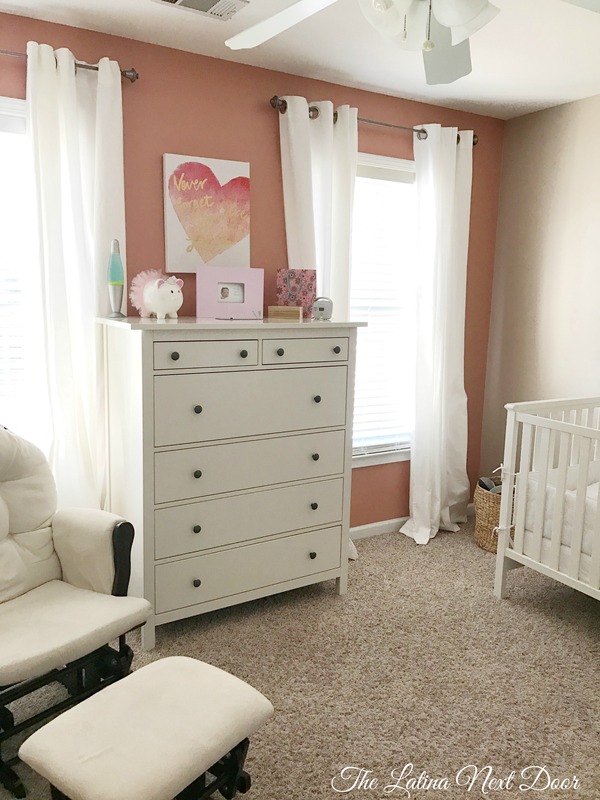 It seems silly to be decorating a nursery now since she will be 2 years old in May, but she is the “baby” so I still get to do it! Right now in the room we have 2-tone walls. I’m into neutrals, but I thought I would try something different for this room and add an accent wall…. I’m still debating whether or not I like it. 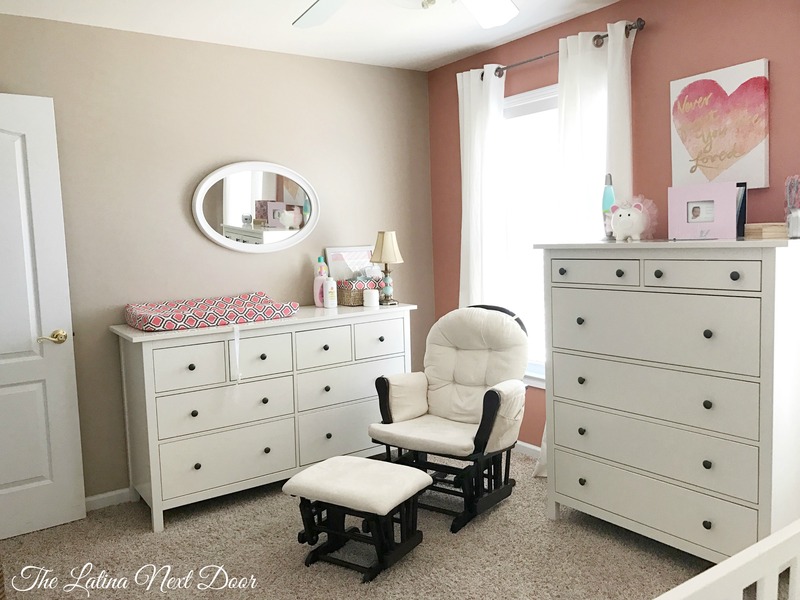 The dressers are from Ikea, the Hemnes Collection. And the glider, we purchased from Wayfair when my son was born. It’s not the prettiest chair, but she loves being rocked in it so we will keep it in her room a little longer. 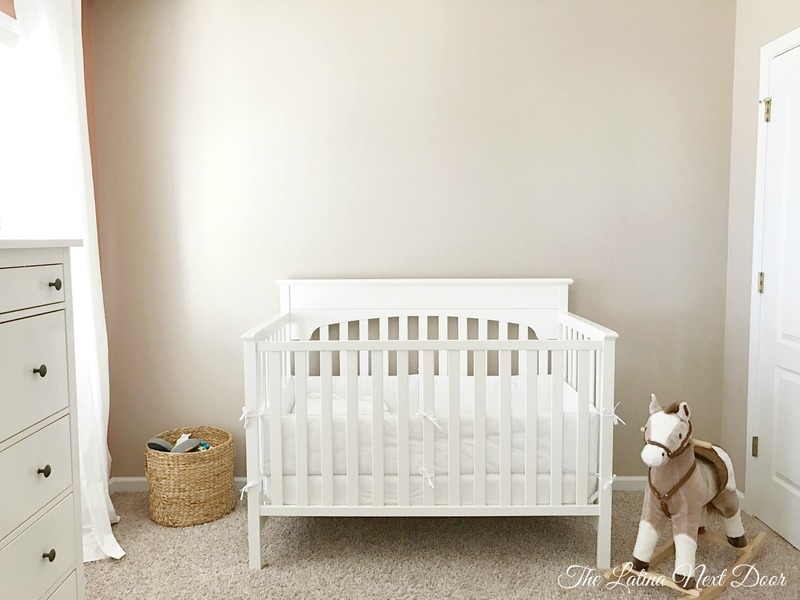 That changing table cover and matching basket insert, I sewed myself along with this easy DIY bedskirt for the crib. The oval mirror, I removed & reused from the powder bathroom makeover. The “Never Forget That You Are Loved” artwork I got at Kohl’s, but they don’t carry it anymore unfortunately. I had to look online for a simple bright white baby bumper since I couldn’t find any at the local stores. I purchased one here and I was surprised at how good quality it was! For now, the first thing I would like to do is add some character to that back wall. It is so plain it kills me! I want to change the ugly knobs on those dressers too since the black makes them pretty big eye sores. And I also think it would be nice to add shelving to the walls. What else do you think I could add? 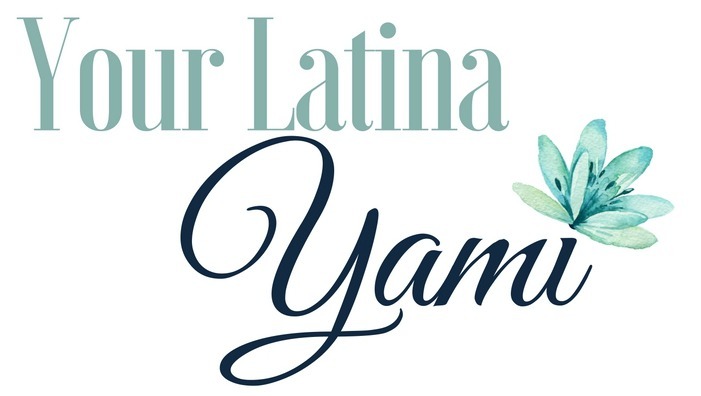 I am gathering a ton of ideas from all over Pinterest, but I would love to get your thoughts well!